Harris, Carolyn. "Catherine (HRH The Duchess of Cambridge)". The Canadian Encyclopedia, 08 January 2019, Historica Canada. https://www.thecanadianencyclopedia.ca/en/article/catherine-hrh-the-duchess-of-cambridge. Accessed 20 April 2019. 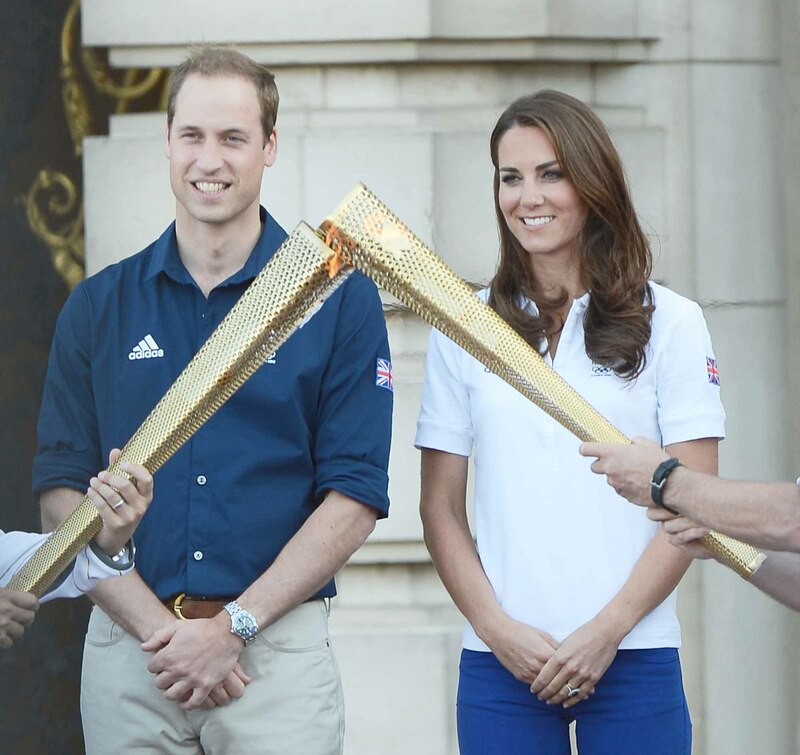 Prince William and Catherine, Duchess of Cambridge welcome the Olympic torch to Buckingham Palace, London, UK. July 26, 2012. Picture: Catchlight Media / Featureflash. Her Royal Highness (HRH) The Duchess of Cambridge née Catherine “Kate” Middleton (born 9 January 1982 in Reading, United Kingdom) is the wife of HRH The Duke of Cambridge (The Prince William), who is second in line to the thrones of Canada, the United Kingdom and 14 other Commonwealth realms. Kate has become famous worldwide for her philanthropy and fashion, and is closely associated with the modernization of the monarchy. William and Kate have three children: Prince George of Cambridge (born 22 July 2013), Princess Charlotte of Cambridge (born 2 May 2015), and Prince Louis of Cambridge (born 23 April 2018). Kate is the first woman from a “middle class” background to marry a direct heir to the British throne since 1660, when the future King James II married Anne Hyde. Her father, Michael Middleton, was a flight dispatcher at London’s Heathrow Airport, while her mother, Carole Goldsmith, was a flight attendant. The Middletons founded their own mail-order children’s party supply business, Party Pieces, in 1987. Kate’s paternal grandfather, Peter Middleton, served in the Royal Air Force during the Second World War, including two years of training at No. 37 Service Flying Training School in Calgary, Alberta (now part of the Calgary International Airport). 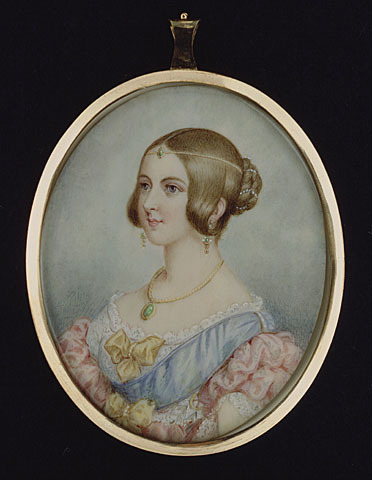 Her paternal great-grandmother, Olive Lupton, was a member of the wealthy Lupton family, woolen manufacturers and members of the landed gentry from Leeds. The Lupton family trust would fund the private education of Kate and her siblings. Catherine Elizabeth Middleton was born 9 January 1982 at the Royal Berkshire Hospital in Reading. She is the eldest of three children. Her sister, Philippa Charlotte, nicknamed Pippa, was born 6 September 1983; and her brother, James William, was born 15 April 1987. Kate spent part of her early childhood in Amman when her father’s work for British Airways moved the family to Jordan from 1984 to 1986. Upon their return to the United Kingdom, the family settled in Berkshire. Kate began her education at an English-language nursery school in Amman, and then attended a series of private elementary and secondary schools in the United Kingdom. She completed her elementary education at St. Andrew’s School in Pangbourne, a village near Berkshire, boarding during the week from the age of nine. Kate attended Marlborough College boarding school in Wiltshire for her secondary education. Kate was active in sports throughout her childhood, particularly field hockey. After a gap year spent studying art at the British Institute in Florence, Italy, and volunteering in Chile, Kate enrolled at the University of St. Andrews in Scotland in 2001. She completed an undergraduate Master of Arts in the history of art with second-class honours in 2005. Her senior thesis examined the photography of Lewis Carroll, author of Alice in Wonderland. William and Kate both attended the University of St. Andrews and became friends when they were enrolled in the art history program. Kate became one of William’s flatmates during his second year of university; they lived in the same houses for the remainder of their degrees, allowing their relationship to begin away from media scrutiny. They began dating in 2003, but their relationship only became public knowledge in 2004. After they completed their degrees at St. Andrews, Kate moved to London where she worked as an accessories buyer for the Jigsaw clothing chain in 2006–07, and as a catalog designer and photographer for the Middleton family business until 2011. William and Kate briefly separated in 2007, but soon reconciled, which prompted intense popular speculation regarding when they would marry. William and Kate became engaged while traveling in Kenya in October 2010. On 16 November 2010, Clarence House announced the engagement. The 29 April 2011 wedding combined traditional and modern elements. The royal couple customized the interior of Westminster Abbey, adding eight 20-foot trees to the nave for the ceremony. Wedding guests included numerous friends of the couple as well as foreign royalty, Commonwealth heads of government and governors general. Kate’s family had prominent roles in the ceremony. Michael gave the bride away, Pippa was maid of honour and James read a lesson. Duke & Duchess of Cambridge (Prince William and Kate Middleton) leaving Westminster Abbey following their royal wedding. April 29, 2011 London, UK Picture: Paul Smith / Featureflash. There was widespread popular interest in Kate’s choice of wedding dress, which remained secret until the ceremony. The dress was designed by Sarah Burton, creative director of Alexander McQueen, and was ivory satin with lace appliquéd on to silk tulle by the Royal School of Needlework. The design was similar to the wedding dress worn by actress Grace Kelly for her wedding to Prince Rainier III of Monaco in 1956. Kate’s wedding dress was displayed at Buckingham Palace during the summer of 2011. Instead of a gift registry, the couple encouraged the guests to donate to a charity from a recommended list. Governor GeneralDavid Johnston represented Canada at the wedding and subsequent reception at Buckingham Palace. The governor general also provided the funding for the Duke and Duchess of Cambridge Award, a one-time scholarship at the University of Waterloo established in honour of the marriage. Prime MinisterStephen Harper donated $50,000 to the Canadian Coast Guard Auxiliary “on behalf of all Canadians” in honour of the wedding, and presented the royal couple with a personal gift of outdoor camping gear. A few hours prior to the ceremony, the Queen bestowed the titles of Duke of Cambridge, Earl of Strathearn and Baron Carrickfergus on Prince William. Thus Kate is styled Duchess of Cambridge, Countess of Strathearn and Baroness Carrickfergus rather than Princess William, as she would otherwise have been known. (She would not have gone by her given name, since only princesses born into the royal family are styled Princess followed by their given names). 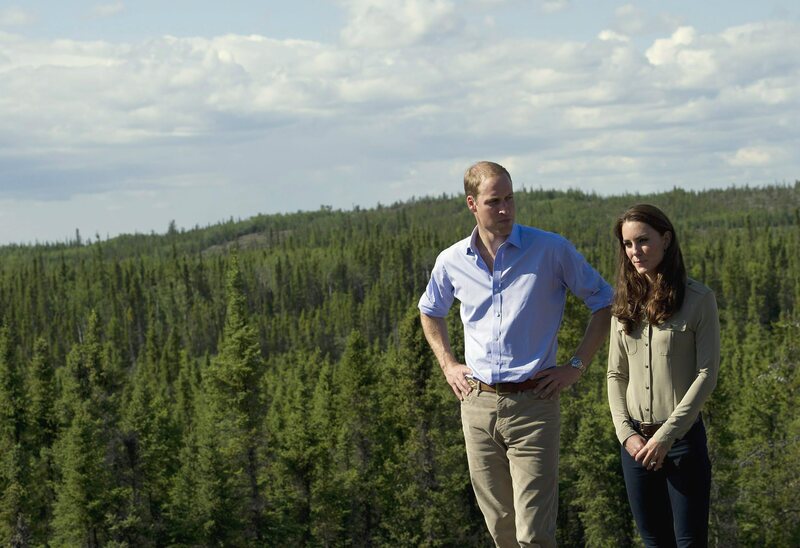 William and Kate toured Canada, their first royal tour as a married couple, in late June and early July 2011. 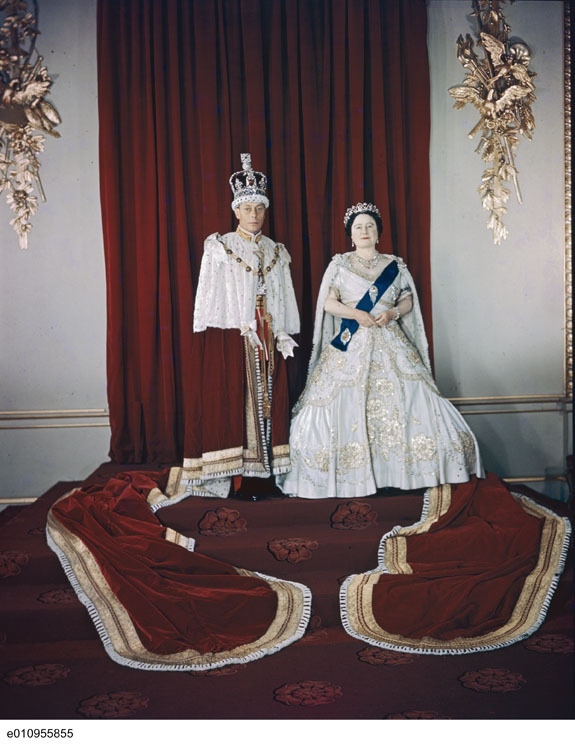 The wedding and subsequent royal tour contributed to a resurgence of popular interest in the monarchy in Canada, after decades of comparative decline. Coverage of tour events on social media introduced a new generation to the royal family. The tour, which included time in Ottawa, Montréal, Québec City, Charlottetown, Summerside, Yellowknife and Calgary, combined traditional and modern elements. In common with previous royal tours of Canada, William and Kate celebrated Canada Day on Parliament Hill, attended military reviews, and visited charities. The couple also demonstrated their athletic interests, racing each other in dragon boats on Dalvay Lake, Prince Edward Island. They also took the time for lengthy conversations with Canadians from all walks of life. Kate was especially praised for her warmth toward six-year-old cancer patient Diamond Marshall, who greeted her with flowers and a hug in Calgary. Kate’s fashions also attracted intense public interest, and she was praised for incorporating Canadian colours and symbols into her wardrobe, particularly her attire for Canada Day on Parliament Hill — a white dress with a maple leaf brooch and a red hat with maple leaf embellishments. In December 2012, Buckingham Palace announced that Kate was expecting her first child. The news was made public very early in the pregnancy because Kate had to be hospitalised for hyperemesis gravidarum, a condition characterized by severe nausea and dehydration. Prince George of Cambridge was born at St. Mary’s hospital on 22 July 2013. In Canada, the arrival of the royal baby was marked by the issue of commemorative coins by the Royal Canadian Mint. The Canadian government sent George a handcrafted blanket and donated $100,000 to a Canadian children’s charity. George’s birth impacted Canadian baby name trends. While George was the 127th most popular name for Canadian boys in 2011, it became the 36th most popular in 2014. In September 2014, there was once again an early pregnancy announcement. The royal couple’s second child, Princess Charlotte of Cambridge, was born on 2 May 2015. Their third child, Prince Louis of Cambridge, was born on 23 April 2018. William and Kate are actively involved in the upbringing of their childrenand employ fewer nursery staff than previous generations of the royal family. George accompanied them on their 2014 tour of Australia and New Zealand. Kate has been praised for her role in modernizing the monarchy through her public image. In contrast to the late Diana, Princess of Wales, and William’s cousins, Princesses Beatrice and Eugenie, Kate has chosen simpler, more accessible styles that women from various social backgrounds can emulate. According to Newsweek, "The Kate Effect may be worth £1 billion to the UK fashion industry," as women emulate her fashions from coat dresses to wedge heels. Kate’s fashions showcase the work of designers from the United Kingdom and wider Commonwealth, including Canadians. On her second wedding anniversary, Kate wore a peach coat by Canadian-born designer Tara Jarmon. During her Canadian tour, Kate wore fashions by Montréal-born designer Erdem and chose an Erdem summer dress for a public engagement while she was expecting George. Although popular public figures, William and Kate have been determined to carve out a private life for themselves and their children; in comparison to other royals, they have also streamlined their household. After their wedding, the royal couple resided in a farmhouse in Anglesey while William worked as a search-and-rescue pilot. Besides protection officers, the couple only employed a cleaner, and Kate was often seen shopping in local grocery stores. When the royal couple visited Canada in 2011, they traveled with a household of only seven people; far fewer than previous royal visits. Kate did not travel with a dresser or lady-in-waiting as was customary in the past. 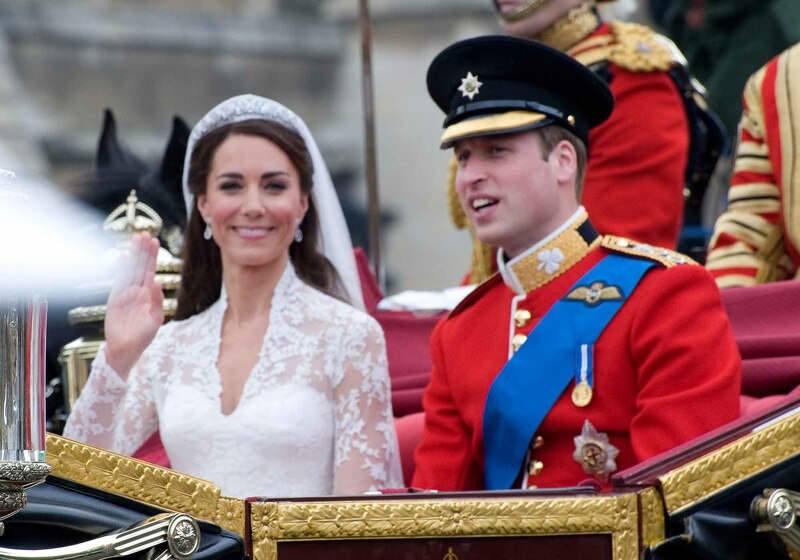 When William left the air force in 2013, the couple moved to London and embarked upon a more public life. Kate oversaw an extensive renovation of the couple’s apartment at Kensington Palace, which prompted criticism in the British press. Shortly after Princess Charlotte, their second child, was born, the family relocated to Anmer Hall on the royal Sandringham Estate in Norfolk. Privacy and William’s new job with the East Anglian Air Ambulance were cited as reasons for the move. The royals ordered an extensive tree-planting program at Sandringham and police distributed letters to the media requesting privacy. As a well-known public figure, Kate’s public image has been critiqued by a variety of journalists and authors. The British press have critiqued Kate’s schedule of royal engagements, criticising her for not undertaking as many public appearances and charitable patronages as other members of the royal family. However, Kate’s many fans have responded with fury to critiques (perceived or real) of the Duchess’s style or personality. In a 2013 public lecture, Hilary Mantel, author of historical novel Wolf Hall, described Kate as someone who “appeared to have been designed by a committee and built by craftsmen, with a perfect plastic smile and the spindles of her limbs hand-turned and gloss-varnished.” The comment, which was in fact part of a plea for media to be more sympathetic to Kate and the royal family, prompted outrage among Kate’s fans. Author Margaret Atwood caused a similar controversy in 2015, when she commented that, “I don’t think she’s become the fashion plate that Diana was, and I think she’s probably doing that advisedly.” Like Mantel, Atwood made the comment during a public lecture, in this case a talk at the Victoria and Albert Museum on the subject of clothing. The comment, which was taken out of context, was condemned by Kate’s admirers in Canada and the United Kingdom. In 2011, William, Kate and William’s brother, Prince Harry, established The Royal Foundation of The Duke and Duchess of Cambridge and Prince Harry, which focuses on three main causes: supporting the armed forces, conservation and young people. In 2012, Kate assumed four charitable patronages: Action on Addiction, East Anglia’s Children’s Hospices, The Art Room and the National Portrait Gallery. In 2013, Kate became patron of Place2Be, SportsAid and the Natural History Museum. In 2014, Kate became patron of the 1851 Trust, which creates opportunities for young people of diverse backgrounds to learn sailing. Kate has also promoted compassionate palliative care for terminally-ill children as well as treatment and resources for children with mental illnesses. From 24 September until 1 October 2016, Catherine toured British Columbia and the Yukon with William and their children. The couple were based at Government House in Victoria (with the exception of an overnight stay in Whitehorse) to enable them to spend evenings with their children after public engagements during the day. As Duchess of Cambridge, one of the key focuses of Catherine’s philanthropy has been the welfare of children and families, interests that were reflected in the public engagements on the tour. In Vancouver, Catherine and William visited the Sheway Pregnancy Outreach Program in the Downtown Eastside for mothers dealing with substance addiction. Catherine, William and their children also attended a garden party at Government House for military families, where George and Charlotte enjoyed pony rides and balloon animals with other children. Like William, Catherine has a strong interest in youth athletics and the couple attended an exhibition volleyball game at UBC Okanagan, and a demonstration of mountain bike skills by Single Track to Success at Montana Mountain in Carcross, Yukon. They also sailed on a tall ship in Victoria Inner Harbour with the Sail and Life Training Society, and traveled by Haida canoe in Haida Gwaii. Catherine showcased the work of Canadian fashion designers during the tour. In Haida Gwaii, she wore a jacket designed by the Canadian company, Smythe. In Bella Bella, Catherine wore gold kite-shaped earrings by Montréal-born jewellery designer Pippa Small. Throughout the tour, Catherine’s fashion incorporated Canadian colours and imagery, including a maple leaf brooch worn by Queen Elizabeth (the Queen Mother) during her 1939 tour of Canada with King George VI. 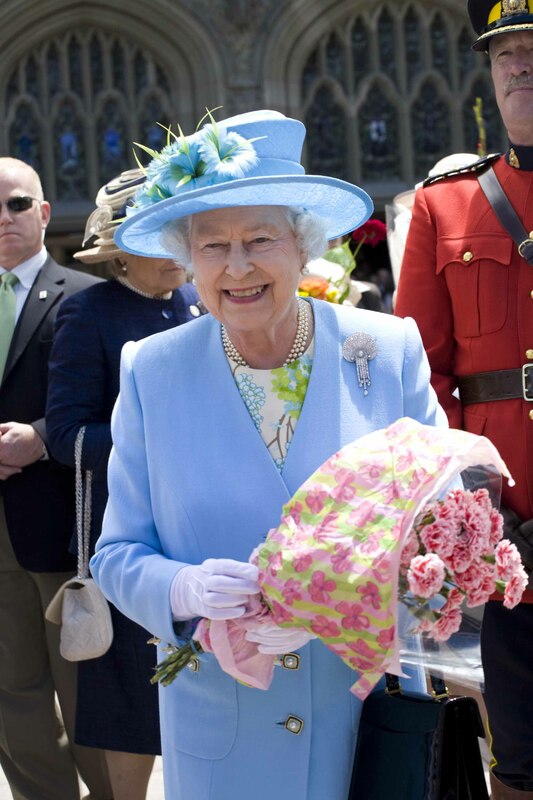 The 2016 tour was well received and the royal couple were praised for taking the time to engage with Canadians from all walks of life, for introducing their children to Canada, and raising awareness of Canadian institutions and philanthropic organizations. In honour of the tour, Prince Minister Justin Trudeau donated $50,000 to the Prince’s Charities Canada to promote education in Indigenous communities and $50,000 to the Immigrant Services Society of British Columbia to help new arrivals to Canada with housing, employment and language skills. Christina Blizzard, Young Royals on Tour: William and Catherine in Canada (2011); Robert Jobson, The New Royal Family: Prince George, William and Kate, The Next Generation (2013), Katie Nicholl, Kate: The Future Queen (2013).